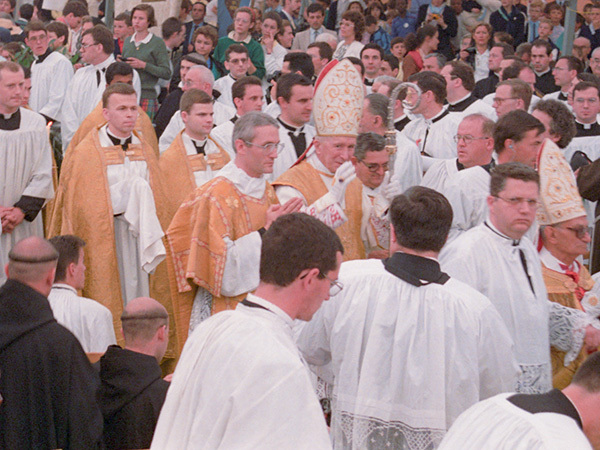 And yet, 25 years after the death of its founder, the Society—blessed with almost 600 priests—is in the vanguard of a Church that is completely in turmoil. Rejected by the pope and the hierarchy, banished sociologically, this institute of Catholic priests manages to build bastions of Christendom, form an elite of triumphant Christians, encourage large families, open schools that are thoroughly Catholic, and to organize pilgrimages and demonstrations of the Faith. Almost everywhere chapels are set up, churches are open to the faithful of all races, languages and walks of life, united in the same profession of their Catholic Faith and in the same liturgical adoration. In poor makeshift chapels, as well as in renovated or newly built churches, they all find themselves at the foot of the altar, turned toward God, their gaze fixed on the tabernacle. The traditional liturgy unfolds majestically, allowing plenty of room for recollection and the praise of the Thrice-Holy God. This liturgy of all time, by its sacred action, really makes present the God of the Eucharist, the fruit of the Holy Sacrifice of the Mass, the Mystery of Faith, in which Jesus, the High Priest, reenacts and perpetuates His sacrifice on Calvary. This treasure is what the Archbishop-Emeritus of Tulle wanted to hand on at every stage of his priestly life. This is the reason for the existence of the Society of St. Pius X.